The focus of the Parent-Child Center is to support children aged birth to six, and their families, by providing numerous diverse services, including a therapeutic play room, parental guidance, personal therapy for parents, parent-child therapy, couples therapy, child therapy, parent-child groups, parent groups, lectures and workshops for parents, and joint parent-child enrichment activities (story time, creative activities, activities for the Jewish holidays). The premise of the center’s work is that the child’s personality and mental health are formed in early childhood, and if we provide help during this critical time, we are able to prevent development of psychological, behavioral, familial and social problems from arising in the future. 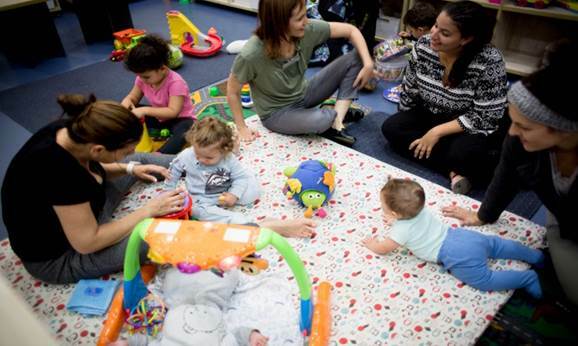 The center is like a home-away-from-home for parents and young children in Jaffa where the atmosphere is accepting, non-judgmental and non-invasive. This atmosphere enables the staff to support both parent and child. The center emphasizes the uniqueness of every child, and that in order for the child to realize his or her inherent potential, he or she needs to be provided with a nurturing atmosphere. The center employs experienced professionals in various fields pertaining to early childhood such as psychologists, social workers, early childhood educational counselors, as well as expressive and art therapists who care deeply about child development and who provide therapy, support and guidance to parents and their children. Statistics show that half of the population in Jaffa are living under the poverty line and about a third of them receive regular assistance from the city’s welfare services.